Denny’s at W Hwy 76 offers a unique dining in Branson where many guests have already come to this place for over 60 years to relax and enjoy hearty meals at reasonable prices. Open 24/7, this fascinating dining spot in Branson serves breakfast favorites along with home-style dinners, hand-pressed 100% beef burgers, and other classic diner fare. Enjoy fantastic foods and all diner favorites at Denny’s. Now, you can even enjoy more the flavors that you’ve been longing for so long such as salted caramel, pumpkin and cinnamon – drizzled, topped or cooked inside their new fluffier buttermilk pancakes. The first location of Danny’s Donuts was opened in 1953 by Harold Butler and Richard Jezak in Lakewood, CA. When Jezak left the now 6-store chain in 1956. Butler created and changed the concept a year later from a donut shop to a coffee shop with store no. 8. Danny’s Donuts later renamed Danny’s Coffee Shops and operated for 24 hours. In 1959. Butler changed the name from Danny’s Coffee Shops to Denny’s Coffee Shops to avoid confusion with Coffee Dan’s in LA. Denny’s Coffee Shops becomes Denny’s in 1961 and the rest is history. By 1967, Denny’s goes international, opening its first overseas operation in Acapulco, Mexico. As a favorite place of many American diners, Denny’s restaurant offers classic breakfast around the clock. Denny’s menu is broad yet familiar, which makes the restaurant a great place to take the kids and family. Denny’s have about 1700 locations worldwide including the U.S. and in more than 11 foreign countries and territories. This famous restaurant is always ready to serve you. Today, Denny’s has many new breakfast recipes such as Buttermilk Pancakes, although their old pancakes were fine, but America deserved better. So, they worked with this recipe. This new pancake has a new addition of good stuff like fresh buttermilk, real eggs, flour and a hint of vanilla. The new recipe resulted to a fluffier, tastier, better buttermilk pancakes. Another new at Denny’s is the Sticky Bun Pancake Breakfast. It is made of cinnamon sauce and cream cheese icing drizzled over two new fluffy buttermilk pancakes. This pancake is served with two eggs and hash browns, plus a choice of two strips of bacon or two sausage links. Strawberries & Cream Pancake is another new breakfast recipe offered by Denny’s. This new pancake breakfast recipe is made of two new fluffy buttermilk pancakes and filled with white chocolate chips, topped with vanilla cream and fresh strawberries. It is served with two eggs and hash browns, plus a choice of two strips of bacon or two sausage links. Double Berry Banana Pancake is another new breakfast recipe offered at Denny’s. This is made with two new fluffy buttermilk pancakes with juicy blueberries cooked inside and topped with fresh strawberries and bananas. It is served similar as Strawberries & Cream Pancake. 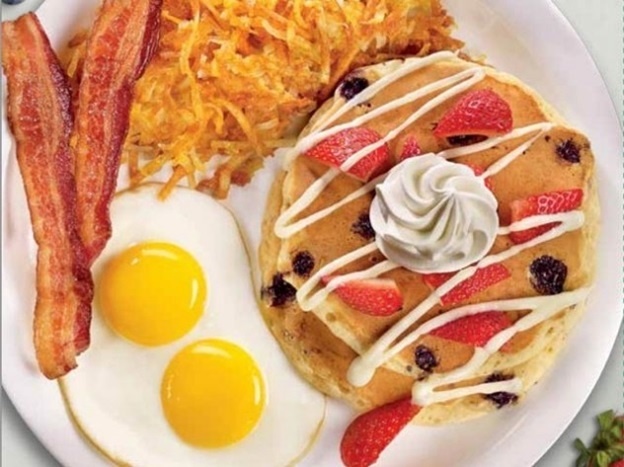 Dining in Branson can be enjoyed best at Denny’s as this dining spot serves breakfast favorites along with home-style dinners.